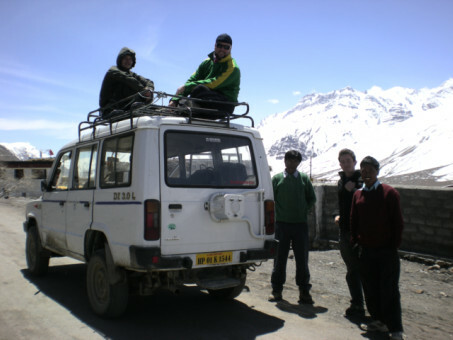 The mountain passes leading to Spiti are only open from the beginning of March to the end of November, making for a very short visiting season but also creating the conditions which make Spiti so unique – isolated, the mountain passes act to preserve the cultural heritage of the mountain peoples. Often road conditions are unlike anything you have ever seen before and require an experienced mountain driver and strong 4×4 vehicle. Nevertheless, there are always delays and landslides throughout the year. The other route into Spiti is from the west on the All Weather Road (which is open all year) from Shimla to Kaza via Reckong Peo. This is a journey of 420km over paved but mostly unpaved road and can take as long as 16hrs – 20hrs depending on road conditions and is best split up with an overnight stay in Kalpa or Reckong Peo. This route requires an Inner Line Permit which is free and can be processed in Reckong Peo or Shimla.